The cape lives on despite being sooo last year. We don't mind at all when it looks this splendid. The bow in the hair completes the classy outfit. If you're wondering, the heavily-laden bicycle in the middle, up front, is a postman. Four panniers and a bag on the front rack. 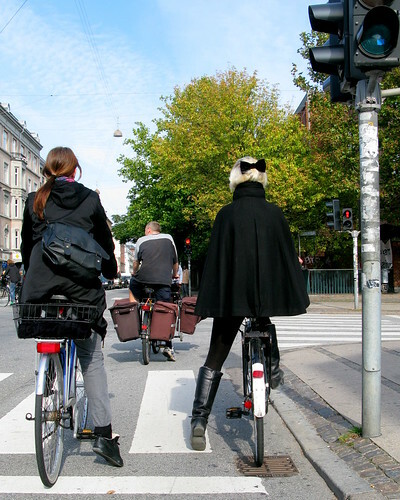 The sun is shining and, although the air is cooler, there are some Copenhageners that haven't quite made the jump to autumn just yet. Luckily. I just love that last shot, gorgeous. I like this site in many ways but I just want to point out one. You highlight diversity in promoting the bike rather than trying the more common, follow the sheep approach even though in many instances there appear to be many trendy and fashion statements.